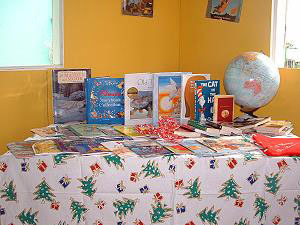 The library was a gift to the children and teachers of St. John’s School from The Iris Foundation for Education, a Canadian charitable foundation formed after Hurricane Iris devastated schools in southern Belize in October 2001. In library orientation sessions held during the week of 8 December 2003, Placencia students previewed a wide array of over 1,500 beautiful books especially selected and purchased for the Placencia Children’s Library by The Iris Foundation, including children’s books on Maya glyphs, reef and rainforest ecology, tropical animals, insects and birds, weather, and Latin American cultures. Volunteers operate the Library. These dedicated adults will rotate on a regular schedule and assist with student research projects as well as book circulation. 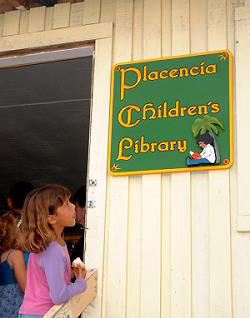 "The Placencia Children’s Library has been made a reality by the many individuals and organizations who generously donated their time, support and money to this project of The Iris Foundation for Education,"
- Marilyn Beckstead, founder and director of the Foundation. 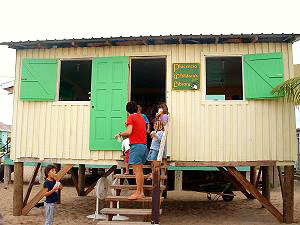 The Placencia Children’s Library is owned by the St. John’s Anglican Memorial School. St. John’s Anglican Memorial School is a primary school, having 242 students from pre-school to Form 6 (equivalent to North America’s grade 8). St. John’s is fortunate in that it has this children’s library, a kitchen and a computer lab. All these are recent additional facilities in the they have been either up-graded or created in the past few years. The Rotary Club of Placencia has been responsible financially for these improvements. Just before Christmas 2017 the old library stairs collapsed and the Rotary built new stairs. The library has a major termite infestation. A recent donation from another source provided the funds needed to discard the old library shelves and have new ones built. The library was recently painted. While, this work is primarily a “Band-Aid” we think the books are now safe, and the building is certainly more attractive and conducive to having children use it. The building needs to be rebuilt and they are actively seeking money to build a new building. In the meantime, many of their books have been well used and some have had to be discarded. We would love to have some new books! The library is always in need of children’s book donations, both fiction and non-fiction for pre-school through Form 6 (equivalent to North America’s grade 8). The library is actively seeking money to build a new building so donations are encouraged.